Portsmouth West’s great defensive play held Northwest to just 6 points in the second half. West senior Dylan Bradford is guarded by Northwest senior Ashton Hall in the Senators 44-29 victory Friday night. 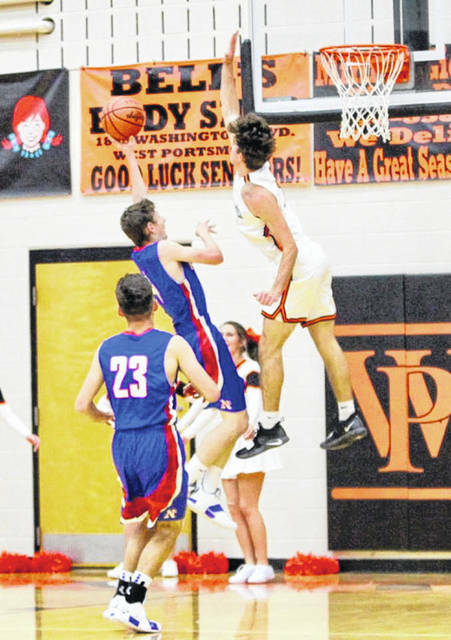 WEST PORTSMOUTH – Portsmouth West dominated the second half of their game Friday night as they defeated the Northwest Mohawks 44-29. 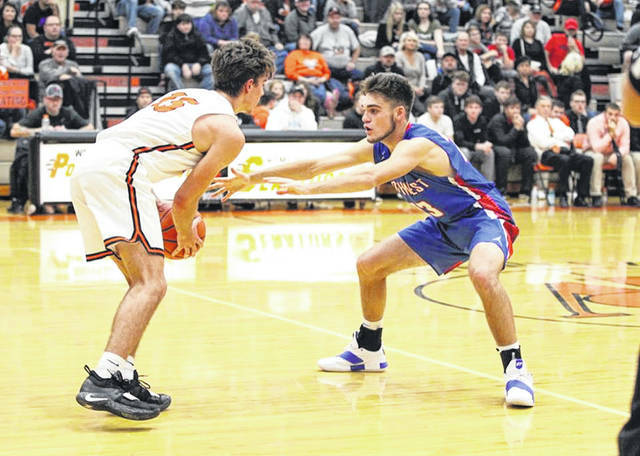 Gabe Skaggs led the Senators in the win with a commanding 25 points for the night, playing in a style that was too much for the Mohawks to handle. Senators head coach Bill Hafer was proud of his senior’s effort to get an SOC win on their home court Friday night. The game started off with Skaggs putting two in the basket for West, that was followed up with Evan Throckmorton scoring on a layup for Northwest. This would begin a back and forth battle between the two teams. Northwest ended the first quarter with a one point edge on the Senators at 17-16. Northwest would pull away at 6:41 in the second quarter from West with a 21-16 lead off of scoring efforts of Ashton Hall, and the defense of Throckmorton who stole the ball twice in a row from the Senators. West would recoup the scoring deficit with the efforts of Skaggs, Josh Berry, Dylan Bradford scoring five points to be just one basket shy of tying up the Mohawks before the half. Nick Davis would score the needed basket for the Senators to tie the Mohawks 23-23 at the half. Skaggs would score 14 points of the Senators 21 points in the second half. Northwest was held to four points in the third quarter and just one basket in the fourth quarter. Skaggs was joined by Bradford during the second half as he scored five of the Senators points for a total of 12 points for the night. Berry scored five points for the night in the win as well. The third quarter ended with a score of 34-27, and West would outscore the Mohawks in the fourth quarter 10-2 for a final score of 44-29. Northwest was led in scoring by Chase McClay with eight points, Hall with seven and Billy Crabtree with six for the night.